On paper a western comedy is a very intriguing prospect, only more so with Seth MacFarlane’s name attached to it. ‘The Man Who Killed The Oscars’ earned plaudits as well as a hefty box office reward for 2012’s Ted (the sequel hits cinemas next year), and in addition to writing and directing A Million Ways to Die in the West (2014) the film sees him make the transition to live-action acting. Though enjoyable in parts, there is a sense that MacFarlane’s sophomore feature fails to fully maximise its potential. 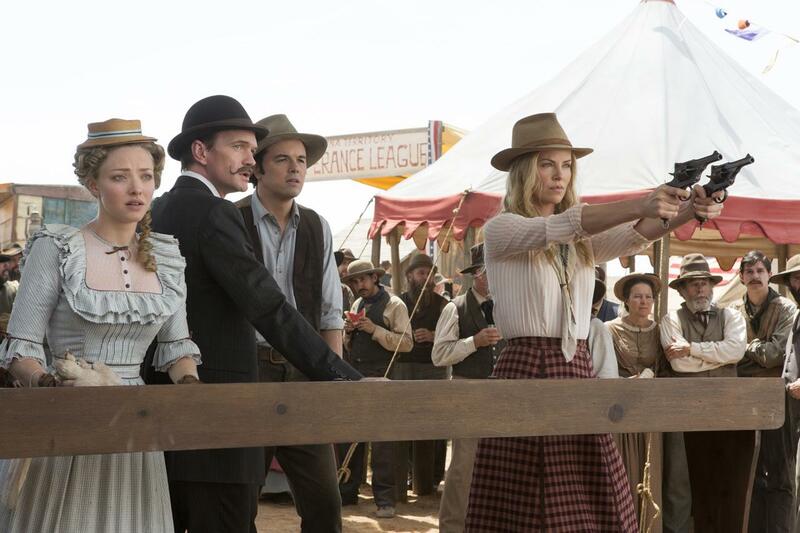 Set in the Wild West of 1880’s Arizona, MacFarlane stars as sheep farmer Albert Stark, a cowardly man whose self-centred girlfriend Louise (Amanda Seyfried) dumps him after he backs out of a gunfight. Wallowing in his feelings of inadequacy, Albert seems set on leaving the unforgiving frontier when he happens upon the mysterious and beautiful gunslinger Anna (Charlize Theron), and the two begin to fall for each other even as she teaches him how to shoot so he can win Louise back. Unbeknownst to Albert, however, Anna’s loathsome husband Clinch (Liam Neeson) is on his way into town. Right from the opening credits MacFarlane’s love for the western genre is clear, with loving shots of Monument Valley from cinematographer Michael Barrett. Indeed, on a technical level A Million Ways… impresses, from the period costumes to Joel McNeely’s score. Unfortunately, MacFarlane’s latest is only sporadically funny. Many of the finest gags have been revealed in the various trailers leading up to release – including the best of what is a superb assortment of cameos – but most disappointing is the grating amount of sophomoric humour, especially since we know the Ted director is so much better than the lazy flatulent jokes he resorts to. Still, the jokes that do land are laugh-out-loud funny, and fans of MacFarlane’s previous work should find plenty to enjoy here. Acting-wise, MacFarlane does a solid job with what is a very sympathetic role, but though his comedic nous is evident he’s lacking the charisma of a leading man. Thankfully he’s surrounded by one of the most star-studded ensemble casts we’ve seen this year, all of whom help elevate the material. Theron makes for a great foil, sharing easy chemistry with MacFarlane and proving just as comfortable with her comedic side as she is for her famed dramatic work in what is a likable turn. Neeson is also clearly enjoying himself as the villainous Clinch, eking every morsel of menace he can from his limited role. It’s Neil Patrick Harris who’s the standout though as the moustache-twirling (and singing) Foy, and he earns consistent laughs throughout. Elsewhere, Silverman and Ribisi play well off one another but feel underused, saddled with an uninventive subplot which holds little payoff. Both laughs and deaths are surprisingly infrequent, and at 116 minutes the film feels overlong, but strong performances and even better cameos mean A Million Ways to Die in the West hits just as often as it misses. This entry was posted on May 30, 2014 by Amonymous. It was filed under Film Reviews and was tagged with A Million Ways to Die in the West, Amanda Seyfried, Charlize Theron, Family Guy, Giovanni Ribisi, Neil Patrick Harris, Sarah Silverman, Seth MacFarlane, Ted. Good review Amon. I laughed some times, but other times, I just felt annoyed. Super disappointed in this one for sure. Thanks! And agreed. Loved the cameos though.